The Taylor 556 12-string Grand Symphony is now discontinued and replaced by models like the 552ce and 562ce Grand Concert. Still, it shows why Taylor took over the spot for ‘King of the 12-String Jumbo’. The Grand Symphony body shape is a full size jumbo, roughly equivalent to the Gibson J-200 or Guild F55. 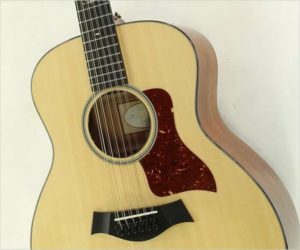 It provides a lot of output power and when built using a Spruce top paired with Mahogany back and sides, delivers that with sparkle, clarity and articulation.